Often very difficult to spot, household textile pests can do a lot of damage to fabrics and furnishings, and it is generally because of this damage that they are discovered. So what pests are likely to be in your house causing damage to your textiles? Moths can be found in many environments and, depending on the moth, they can cause a lot of damage in your home. Common Clothes Moth species can be distinguished by the way their wings fold tent-like along their backs. The Common Clothes moth lays forty to fifty eggs before dying, and are difficult to spot in their pupal stage as they tend to scurry rather than fly. The moths themselves are harmless, but their harder to spot larvae feed on fabrics produced by animals such as wool and fur. The Brown House Moth lays its larvae close to its food source, dry animal protein such as feathers, hair and wool. Two to four weeks later their larvae will then eat the food source for the next two to five months, before reaching their pupal stage and beginning the life-cycle again. Like the Brown House Moth and the Common Clothes Moth, the Case Bearing Clothes Moth love feeding on woollen clothing, furs and carpets. They differ in that the larvae spin a case around themselves and the case moves when they do, hence the name Case Bearing Clothes Moth. Once you have discovered you have a moth problem all you can do is remove the affected textiles and clean the area, and then you need to make sure you treat the affected area with insecticides, as the danger comes from the larvae you are unable to see. 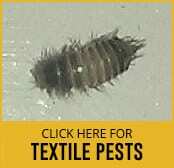 In addition to moths, household textile pests also include the Varied Carpet Beetle and the Fur Beetle. The Varied Carpet Beetle enjoys eating objects that contain hair, wool, fur, feathers, horn and silk, whether they be clothing or furnishings. The beetles are round in shape, come in a variety of colours and are 2-4mm in length. Their larvae are dark brown and covered in black hairs. The Fur Beetle is slightly larger, 4-6mm in length, and are distinguished by one white spot on each wing. Fur Beetle larvae are similar to the Carpet Beetle, but they have brown furry hairs. They also differ in that they prefer eating along the seems of fabric, leaving distinctive round holes in their wake. Once you have identified a beetle textile infestation you need to remove the affected items and thoroughly clean the infected area, including vacuuming in the cracks and crevices. However, you will still need to treat these areas with insecticide as the beetles and bugs can move once their food source has been removed. With all Household Textile Pests having a professional assess and treat affected areas is essential to ensure that you have not only removed the current problem, but also prevented future infestations by removing all the unseen larvae. You can also then be assured that you are using the most effective products in a way that protects your family.